Voters also rejected proposed changes to New Zealand’s voting system with is partly proportional. THE LEADER OF New Zealand’s Labour party conceded defeat to Prime Minister John Key’s National Party in elections today, paving the way for him to return for a second term as the nation’s leader. The dominant performance by Key’s National Party, however, appeared to come up just short of giving it enough votes to govern alone. Key is likely to find enough support among minor parties to shore up his leadership. With most of the vote counted Saturday, the National Party was projected to win 60 of Parliament’s 121 seats, an increase of two. The Labour party had just 27 percent of the vote, meaning it will lose about nine of its 43 seats and prompting party leader Phil Goff to concede to Key. “It wasn’t our time this time,” Goff told supporters. The Green party, on the other hand, won 11 percent of the vote, its best showing ever. But the big news among minor parties was the return of the anti-immigration New Zealand First party to Parliament after it didn’t win any seats in the last election. The party was winning nearly 7 percent support, enough for about eight seats. 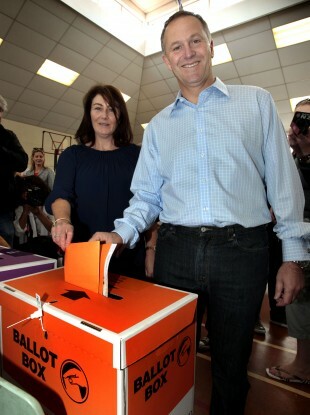 The election has been driven by Key’s personal popularity. After three years in power, polls have shown the former currency trader is far more popular than the Labour party leader, Phil Goff. Key has earned the nickname “Teflon John” for the way that nothing politically damaging seems to stick to him. “He’s a clever strategist and a good manager,” said Jennifer Lees-Marshment, a political studies lecturer at the University of Auckland. She said Key has been adept at knowing when to forge ahead with policies and when to pull back. His common touch was reassuring to people when a deadly earthquake struck Christchurch last February, she said, and enabled him to share in their excitement in October when the country’s national All Blacks team won the Rugby World Cup. Key’s campaign has focused primarily on the economy. He’s promising to bring the country back into surplus and begin paying down the national debt within three years. Part of his plan to achieve that is to sell minority stakes in four government-owned energy companies and in Air New Zealand. That’s where the centre-left Labour party found its biggest point of difference. During the campaign, Goff promised not to sell anything and to raise money by other means, including by introducing a capital gains tax and by raising the age at which people get government pensions by two years, to 67. On the campaign trail, however, those issues got crowded out by a mini-scandal known as the teapot tape saga. While meeting at a tea shop with a political ally, Key reportedly made rude and embarrassing political comments that were captured on a recording device left by a cameraman. Key complained to police on the grounds that it’s illegal to record a private conversation, and the tape never went public. Lees-Marshment said she thinks voters grew tired of the attention given to the story and may have begun feeling more sympathetic toward Key. The saga certainly didn’t seem to do much to boost the campaign of Goff, who was effectively shut out of any coverage for a few days. Labour’s lackluster result has pundits speculating Goff will be replaced as leader of the party within days of the election. But the saga did seem to boost the fortunes of Winston Peters, who leads the small New Zealand First party. Peters grabbed the headlines with pointed criticism of Key over the affair and his poll numbers shot up. Early results also indicated the Green party would get about 13 seats, a result leaders would be happy with. Voters were also deciding on whether to keep their electoral system, in which parties get a proportion of parliamentary seats based on the proportion of the votes they receive. Some wanted to return to a winner-takes-all format, although polls indicated most favored sticking with their current system. In early results, about 54 percent of voters were favoring keeping the proportional system. Email “New Zealand's PM retains power as anti-immigration party boosts support”. Feedback on “New Zealand's PM retains power as anti-immigration party boosts support”.